Welcome to Kimchi Korean Restaurant! We offer a wide selection of authentic Korean dishes, made with the freshest and highest quality ingredients. Check out our latest menu specials and featured items, and connect with us on Facebook to receive e-mails with our latest deals and coupons! 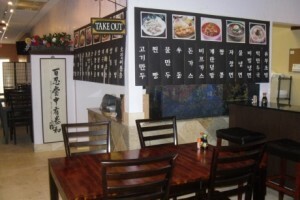 Located in Oviedo, Florida, we offer an enjoyable dining experience, complete with free wi-fi and Korean television. If you're in a rush, call ahead and order our food to-go! Kimchi Korean Restaurant opened in November 2010 bringing authentic Korean food to the Orlando area. Kimchi offers traditional Korean cuisines including soups, stews, casseroles, seafood, Korean BBQ, noodles, and vegetarian dishes at reasonable prices. It is the perfect restaurant if you are looking to try something different! My sister and I went here for our first taste of Korean food, and we have found a treasure! The food was excellent ... Everything put in front of us was delicious, especially the Jeyuk Bokkeum! The staff was unbelievably friendly and helpful with acclimating us to the culture of the food, and recommended some items for us to try. It was a great experience, and we will definitely be going back. This is a must try! The environment is comfortable with large tables and large chairs. They have space for large parties. Service was friendly and helpful, despite the language barrier. Kimchi is a diamond in the rough (Oviedo).